Elements of Orthopedic Surgery describes the common conditions treated by orthopedic methods. This book is composed of 11 chapters specifically presents the essential steps of orthopedic operations. Orthopedic surgery is concerned with anatomy and with neuro-muscular physiology, and it includes the pathology of a considerable part of the body aiming to restore normal physique and function. 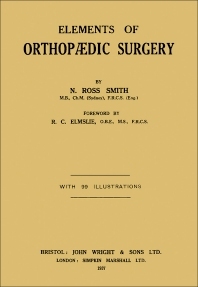 The opening chapter provides a short statement of the organization of cripple welfare work and the significance of orthopedics. The succeeding chapters are devoted to the pathological aspects of various deformities and the necessary steps of orthopedic operations. These deformities include congenital and postural deformities, rickets, nervous system and rheumatic diseases, and bones and joints tuberculosis. The concluding chapter deals with the mechanical principles in fracture treatment. This book is directed primarily toward orthopedic surgeons.